Important: these numbers are very squishy. We picked 20 metro areas (including the Capital Region). Some of these were picked because they're nearby (e.g., Syracuse). Some were picked because they're big metros we figured would have lots of sushi places (e.g., Seattle). And some were picked because we figured they might be sort of like the Capital Region (e.g., Raleigh). We used metropolitan area population totals pulled from this table on Wikipedia, which was based on 2009 Census Bureau estimates. So, those numbers are pretty good. Here's the fishy part (ouch, sorry, couldn't resist). Counting the number of sushi places turned out to be trickier than we though it would be. After going through Google, Bing, Yelp and a few other services, we settled on using Yellowbook.com. We tried our best to get a good count from the listings, often using searches for "sushi surrounding (name of central county in metropolitan area)." As a result, these numbers are almost certainly not 100 percent correct (especially when you add in new/closed places). For the Albany numbers, we pulled the count from Yellowbook and then did our best to weed out places that no longer exist (e.g., Saso's) and add in places that are new, but not listed (e.g., Kitsu). The full list is embedded below. If you notice any additions/subtractions, please let us know. + In these rankings, the Capital Region does appear to have a relatively high number of sushi restaurants per 100,000 residents. But the Capital Region's count doesn't come close to some of the places ahead of it. + We finally came out ahead of Austin in something. 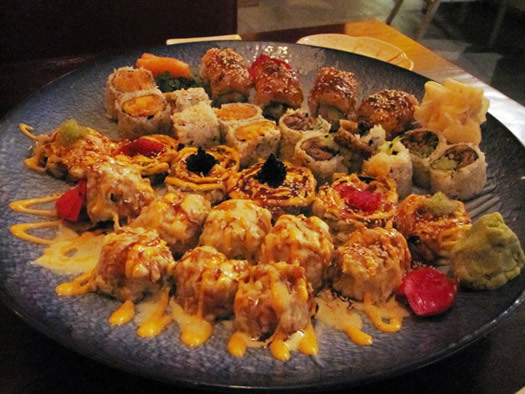 + The Albany area and its sushi love seemingly stick out in upstate New York. Buffalo, Syracuse and Rochester were all way down at the bottom. + Though we didn't pull the data, our (flimsy) guess is that two factors influence the number of sushi places in a metro area: the numbers of Asians and the number of people with higher incomes. So, are there too many sushi places in the Capital Region? Well, based on these squishy rankings, it's probably fair to say the Albany area isn't lacking for choice, relative to other cities. From an economic perspective, you could say that as long as all these places can stay in business, there's the "right" number of sushi restaurants here. And from a culinary perspective... well, all the competition may spur the existing restaurants to get better, so that could be good. And some of the new spots, such as the Sake Cafe on New Scotland, have been welcome additions. But even more sushi places? Can we pick something from a different trend? My issue has more to do with places like Capital Thai, Arirang and Shining Rainbow also serving sushi. I don't want sushi at my Thai restaurant! I just don't! Sushi is something that requires a certain amount of focus and care - call me skeptical, but I just don't think you can properly achieve that focus when you're also serving about a bazillion pan-Asian dishes. Also, I think Yuri is closed now. @MattW: You're totally right about the significant digits. I just couldn't figure out how to convince Google Docs to round them off. I did the same for "Italian restaurants" and got 85, or almost 10 per 100K. I'll take a Sushi place over yet another "mama's chicken parm" joint any day. For some reason I thought the number of sushi restaurants in the area would be higher. But in the mean time, you've given me a list of places to try. I'd never even heard of Jeon's Tokyo Sushi before. I thought Sushi King was it in Troy. i went into Nikko, the new "Sushi buffet" last night, to see if you could get sushi from the buffett to go. You can, and it's awesome! They charge you by the peice, $0.55 for regular sized roll peices, $1 for Sushi or fancy roll pieces. The quality is good, and the creativity in the fancy rolls is very good! I walked out spending $10 and very happy! I'm ok with another sushi place, if they are being innovative and trying to change the game a little. Missing from your list: Mr. Wasabi, Schnectady. I don't think it is possible to have too many sushi restaurants. The only problem I see is trying to financially support my sushi habit. Great read! Thanks for putting this together! I share jess's sentiments here on this ubiquitous pan-asian bs. I've never had Korean food, but have always wanted to try it, but to my knowledge there were no Korean places in the CD. Then a friend told me about "a Korean place" out northern blvd. way. Turns out she was talking about Ta-Ke, the Japaneses Steakhouse/sushi place. So is it real-deal Korean or not? Well, I don't care. I don't want their Japanese or their Korean now, want nothing to do with the place in general. I'm aware there are probably better ways to judge the authenticity of a restaurant's cuisine (not to mention that authenticity shouldn't necessarily be the gold standard either), but...*realizing I don't have a point*. They recently re-opened. They used to be between where Applebees/Starbucks is now on Troy-Schenectady Road years ago. You know, we have the AOA ice cream tour. I think we need the AOA sushi tour. *ahem* Let the sushi snob through. I have a few problems with this (actually, more as a scientist than a sushi snob, and not because of the significant digits). First of all, and this is just me being picky, but the Albany-area list is off. There are places that aren't on the list but should be, places that are on the list that shouldn't, and also I'm not sure how you selected what is or isn't a sushi restaurant (a la Jess's comment). Secondly, and more importantly, by "correcting" the Albany-area list but not others, you've effectively introduced bias into your calculation. Did you weed out more than you added? Did you add more than you weeded out? If either are true, the bias is there because the sushi numbers from teh other locations are, effectively, "raw". I'm not going to fault you for anything here or beyond (not that I'm really trying to "fault" anyone in the first place - heck, it's a blog post about sushi), but who knows what "surrounding" area Yellowbook is pulling from and how the metro areas that the population counts are taken from would overlay with them. Still, this is a noble effort and I commend the idea. From travelling around a bit, I can say from experience that sushi has become far more prevalent over the past decade on a national level. It's quite likely that we're not the only community having this discussion. Oh, and re: Albany Jane's comment - there is no Jeon's in Troy. It's mapped in the location of what was once a dentist's office and it's sitting vacant with a for lease sign on it. How it got indexed as Jeon's Tokyo Sushi is beyond me. We NEED a Nigerian or African restaurant in the Capital District!! But how many of them are actually good AND authentic. WTF is all that goo on the plate in the photo? Disgusting! I've been to Nikko, Arirang, Mr. Fuji and Sushi Thai Garden. All were fine. However, I think someone who lived in Seattle or San Francisco or Portland or Los Angeles would probably call them "Asian seafood places" rather than "sushi places". In Japan, sushi chefs go through rigorous training in things like how to serve fugu to diners without killing them or how to prepare live shrimp for aba ebi. Those chefs command a pretty steep salary which is why many sushi places on the west coast employ chefs who have not had that training. They can still make pretty good sushi but some of the refinements may be missing. The other thing that defines the sushi hierarchy for me is the range of fish offered. To me if they don't have saba (raw mackerel marinated in rice vinegar and sugar and very easy to find frozen) they are catering to a purely western taste. Nikko has saba, Sushi Thai doesn't. But what I really need is uni, which is sea urchin roe. Again, this is something that is not that rare though it is expensive. Jim L, a Korean guy who used to write reviews on Yelp, looked high and low for uni in the cap district and finally left town in despair. I'm not dissing the places listed but merely pointing out that there is sushi beyond what we typically experience here. With so many places serving the sushi basics, maybe there's room for a chef to amp it up a notch with more sophisticated ingredients or preparations. We need better Thai food, like the Lemongrass in Syracuse. Now that's a good restaurant! "In Japan, sushi chefs go through rigorous training in things like how to serve fugu to diners without killing them or how to prepare live shrimp for aba ebi." Really, Otis? All of them? And there aren't any third-rate takeout joints with dry yellowtail that don't event have scallop on the menu in Japan? PS: San & Bada's, which used to be in what is now Sushi Tei, had both uni and fairly authentic Korean food. Sigh. Can we all just agree that Ichiban is overrated? Is there really such a thing as too much sushi? I love that there is variety and many places to choose from, including pan-Asian places, because while I love me some sushi, my loved ones aren't always in the mood. And then again when we're at Sake Cafe and the table next to us gets a beautiful curry, I sometimes rethink my Monkey Roll and go for some Panang. @StanfordSteph - You're asking too much for authentic sushi in the US. I would estimate that 95% of sushi chefs aren't even Japanese (most are Chinese). Same for the people who distribute the fish to the sushi places. @B - you want good uni? Go to Okinawa on a Tuesday night or Wednesday afternoon. They usually only get a small amount of it but it comes in fresh almost every Tuesday between lunch and dinner. @Otis; Mr. Fuji has most definitely had Uni on their specials markerboard in the past. Can't say they always have it, but I remember trying it at one point and being pleased. @StanfordSteph: that is indeed mayooooooooooo! We happened to order the mayo-heavy rolls that night, and while I have no claims to knowing how authentic the use of spicy mayo is - it sure is delicious to these buds! As long as they are quality joints, I've got no problem with an abundance of sushi places. I'm partial to Yoshi Sushi in Latham. Please a) don't take any philosophers with you on your tour and/or b) make sure to request an adequate number of chopsticks to avoid a dining philosophers sushi deadlock! As to too much sushi, for me, that is, regrettably, any, for allergen reasons. Now, if we had a decent Mongolian Barbecue place, ala Khan's in Minneapolis, I'd be doing a happy dance. /CH, Okinawa is usually what I mention when people are looking for decent sushi in the area. It's been consistently the best, every time I've been. I just wish it wasn't quite so out of the way for me. I was mainly sighing over the loss of San & Bada's, a really underrated spot. Wow. Thanks for the list. I've only been to 11 of those listed. Have to get busy and get to the others. Those shown in the picture (fried, with mayo) seem to be a new trend. I can eat a few pieces of those but I still prefer the basic, plain ones. Yoshi! Yoshi! Yoshi!...Though I tried Nikko, and normally I would never get Sushi at a buffet, but they have very good, attentive staff who keep everything fresh. Great food for the price. But I'll always prefer Yoshi! Ginza in Latham Farms is closed...just drove by and it's empty, and the liquor store has been on vacation for months I believe. I had very very good Korean food at Kabuki in Peter Harris Plaza. They don't do korean hibachi at your tables, but the food was very very good and authentic. I've been to many Korean restaurants in NYC and have been to Korea back in 1979...Kabuki does a fine job.